There is a preconception in modern football that simply by being a professional player you earn vast amounts of money, the level of which the average person on the street can only dream of. For those footballers privileged enough to play at the very top level of the game, this is usually true and the tabloid newspapers reveal the weekly wages of high profile players on a regular basis. However, further down the pyramid the story can be very different. The tale of players moving from club to club to fight for their next contract is habitual in the Football League and without football many players would have very few options in life. Add to this the fact that professional football is a frivolous career in itself and you have a potential recipe for disaster. An array of factors can bring the career of a professional footballer to an end, most commonly through injury incurred whilst playing amongst other issues. Once that career is over, in the majority of cases there is very little to fall back on in the way of education and real-life skills in order to sustain a living.This can often lead to financial troubles and as the documentary, Football’s Lost Fortunes pointed out, around 3 in 5 footballers will face the threat of bankruptcy in their lives, a surprisingly high statistic without doubt. Bearing all that in mind, this is the story of Lewis Emanuel, the former Bradford City left-back whose circumstances led him down the wrong path as he ended his professional football career in the most unimaginable fashion. Emanuel made his debut for the Bradford first team as a fresh faced 17-year-old in August 2001, starting in a 1-2 League Cup victory over Macclesfield Town. This was the beginning of the 2001/2002 campaign and after two seasons in the Premier League Bradford were only just beginning the long and dark journey to League Two. Financial mismanagement by the club’s ownership plunged Bradford into turmoil in what would turn out to be one of the darkest periods in the club’s history. Consecutive seasons of relegation, a long string of managers and two periods of administration have left deep physical and mental scars on the club and its fans, some of which still remain to this day. However, one of the few positives for Bradford during their troubled times were the young players like Lewis Emanuel, who were breaking into the first team squad. Danny Forrest, a promising forward and defender Simon Francis alongside Emanuel came through the youth ranks at the club in 2002 and 2001 respectively. In the years that followed, the academy continued to nurture more local talent into the first team including John Swift, Craig Bentham, Tom Penford and Joe Colbeck. All of the above were amongst the most talented footballers developed by the youth set-up but they all share one common denominator. They have all endured a descent into obscurity over the course of their careers, arguably victims of Bradford’s plight in the post-Premier League era, but none more so than left-back, Emanuel. The emergence of Emanuel, Forrest and Francis had given the club and its fans hope for the future and Emanuel in particular had proved to be one of the most promising players to break into the first team. He’d made the left back position his own since his debut in August 2001. Strong and powerful, Emanuel had all the attributes required of the modern day all-action full-back. “Lewis has got a big future, especially because there aren’t that many good left-sided players around. “Portsmouth have Matthew Taylor, who cost them £400,000 in the summer but clubs aren’t exactly falling over those type(s) of players. Lewis has got something to offer going forward and I also think he is possibly a better defender than Taylor. Wetherall, like many people around the club, believed the youngsters were vital to City’s stabilisation and eventual progress as a club. However, with City struggling for cash, a substantial transfer fee could have tempted the club to sell their promising youngster as was the case with Simon Francis, who departed Valley parade for Sheffield United in 2004 after the administrators had stepped in. 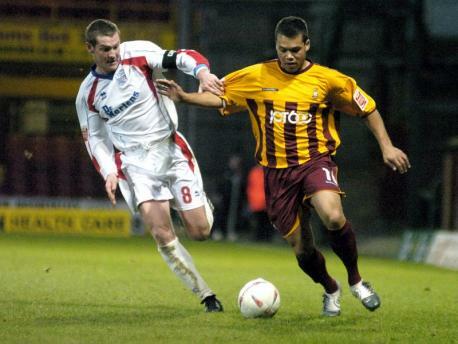 In 2004, Emanuel signed a new contract which would keep him at Bradford until the summer of 2006. This also meant his future was secured for at least another two years despite the fact the club had gone through its second period under administration since relegation from the Premier League in 2001. Retaining Emanuel’s services on the field had paramount importance, especially as the club battled against relegation but moreover, Bradford would still have the opportunity to retrieve some monetary benefit from his sale should other teams show an interest in him. By the end of the 2005/2006 season, City had secured mid-table mediocrity in League One for the past two years with an eleventh place finish in both campaigns and seemingly stabilised their financial position after two periods under the administrators. During the latter part of that season Emanuel produced one of his more memorable performances for the Bantams as he grabbed two goals to beat Yorkshire rivals Doncaster in April. The second of which was a left-footed thunderbolt from the 25-yards, smashing against the underside of the bar before crossing the line to secure a 1-2 victory. His second goal was somewhat of a trademark strike from a left-back, a goal reminiscent of Roberto Carlos in his prime. It was a spectacular drive where power and swerve left the keeper with no chance and the entire crowd applauding. At the end of the 2005/2006 season, Emanuel’s contract was up for renewal and there was uncertainty surrounding the then 22-year-old’s future with Championship clubs reportedly chasing him. City was still under stringent financial constraints at the time and Emanuel was offered a new, non-negotiable one-year contract. His decision was made and Emanuel turned down the offer of a contract extension from his hometown club in favour of Championship side, Luton Town where he signed a two-year deal. He had made a total of 139 league appearances for the Bantams between 2001 and 2006 where he became something of a fans favourite. Since his departure from Bradford, his career as a professional footballer has been on a dramatic downward trajectory, much like that of the club he left and the club he joined. The Hatters suffered relegation to League One at the end of Emanuel’s first season and the clubs fortunes were to worsen as time went on, entering administration in November 2007, incurring a 30 point deduction for the 2008/2009 and eventual relegation from the Football League at the end of the same season. Despite being ever-present in the side during his first season, Emanuel endured a torrid time with the Hatters’. He was tormented by several, re-occurring injury problems which restricted his time on the pitch. Despite this injury ravaged spell, it was not all bad news for Emanuel as he lifted the Football League Trophy, starting in Luton’s 3-2 win over Scunthorpe at Wembley Stadium in 2009. A brief upturn in fortunes for the player and the club whose respective fates seemed to be running in tandem. He was subsequently released by Luton at the end of the 2008/2009 season. However, in a strange turn of events, after unsuccessful trial periods elsewhere, Emanuel re-signed for the Hatters for another two years. But fate struck once again and his career was interrupted by injury, this time a broken toe that required surgery. Struggling with injury and personal problems outside of football, his failure to report for pre-season training at the start of the 2010/11 campaign was the final straw that severed his ties with Luton as his contract was cancelled. And so the tide turned as Emanuel set upon the path to destroy his own career. Emanuel’s football career was almost non-existent since his departure from Kenilworth Road, minus a brief spell at Barrow. He subsequently descended into a life of crime and sealed his own fate in May 2013. Two men carried out an armed robbery of a post office in the village of Skelmanthorpe, Huddersfield on 24th May 2013. The Huddersfield Daily Examiner, in a story published the day after the crime took place, reported that the two of the men entered the post office wearing balaclavas. They began shouting “Give us the money! Give us the money!” whilst brandishing firearms at the stunned customers and staff. The terrified post-mistress was forced to hand-over all the cash in the post office and open the timed safe under the orders of the two aggressors. A traumatic ordeal to go through nonetheless but only exacerbated whilst staring down the sinister barrel of a sawed-off shotgun. Not only that, but the customers inside the post office, including a two-year-old girl, were all forced to lay on the ground at gun-point in the terrifying affair. Two separate getaway vehicles, a Vauxhall Vectra and a Transit van were on hand to help the felons make good their escape. The robbers netted around £16,000 from the raid which is quite a meagre sum in the context of wages earned by professional footballers. Despite the fact that Emanuel never earned Premier League money and spent the bulk of his career at two clubs who went through extended periods of financial turmoil, the question remains what had he done with any of his previous earnings? The most obvious conclusion is that he encountered financial difficulties to some degree after he slipped out of professional football. Craig Ward, 25, Kiran Terry, 25 and Lewis Emanuel, then 29, all from Bradford were arrested in connection with the robbery and in early September 2013 both Ward and Emanuel appeared at Hull Crown Court charged with armed robbery and possessing a firearm. Emanuel admitted his involvement but only to a lesser extent as the getaway driver of the second vehicle in the heist, as if that would provide him with some sort of moral high ground. “Mr Emanuel was once a man who had the world at his feet. Quite literally. He played professional football appearing at Wembley and appearing in the Premier League. Emanuel clearly had difficulties adapting to life outside of professional football, frustrated by persistent injuries and with no club to support him, turning to a life of crime for a quick buck may have seemed like the easy option for him. However, that is no defence for his actions. The PFA is doing great work to support footballers and it is not always possible to help every current and former player who encounters difficulties. Sometimes it is up to the player him or herself to seek help before they end up in a similar situation to Lewis Emanuel. But then again, we also need to encourage a cultural change where seeking help is not deemed a weakness. This culture of perceived weakness is something which blights many professional sports, not just football. It is too late for Lewis Emanuel as he has all but lost any opportunity to re-forge a career in the professional game. He is now 30-years-old and set to spend 8 years in prison for his crimes. Even if he only serves half of that sentence, he will be past the age where he could feasibly return to play at a professional level. But then again, maybe that is also part of his punishment. ← Bayern Munich’s Swiss Star: Xherdan Shaqiri’s future in Bavaria?